On October 31st, at the end of a month of discussion, campaigning by DBDUC and meetings behind a number of closed doors, Dartington Hall Trust (DHT) decided it would not be withdrawing the 14 sites it had submitted for consideration in South Hams District Council’s ‘Our Plan’ process. This contradicted assurances given by DHT’s Jo Talling at a Dartington Neighbourhood Planning meeting, and numerous indications that it was being considered seriously as an option. DHT CEO Vaughan Lindsay and Trustee Stephen Jones issued a statement justifying their decision. Here we analyse their statement, and why, rather than demonstrating decisive and responsible leadership, it shows the weak, unprincipled, risk-averse and morally-bereft leadership currently in charge at DHT. “In August, South Hams District Council began a period of consultation on potential land for development as part of their ‘Our Plan’ long term planning process. Several sites owned by DHT have been potentially allocated as suitable for development. While we believe some development is needed, this provisional allocation seems disproportionate for one Parish. We raised these concerns to South Hams District Council and they agreed to a month extension to the initial stage of their ‘Our Plan’ planning process”. Throughout this process, Dartington’s well-oiled PR machine has tried to spin its actions in the best light possible. This is no exception. The reason that “several sites owned by DHT have been potentially allocated as suitable for development” is because DHT submitted them, and then employed consultancy WYG to put pressure on SHDC to consider them. Then, in the face of a huge campaign by local people and a fiery ‘Community Conversation’ meeting, DHT began to back-pedal, trying to make out that they were shocked by the degree of interest in their sites from SHDC. Had there not been a huge community backlash against DHT’s proposal, we can be sure that they would not have felt the allocation was “disproportionate”, rather would have been rather pleased at the outcome of their intensive lobbying of SHDC. 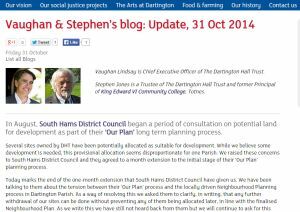 “Today marks the end of the one-month extension that South Hams District Council have given us. We have been talking to them about the tension between their ‘Our Plan’ process and the locally driven Neighbourhood Planning process in Dartington Parish. As a way of resolving this we asked them to clarify, in writing, that any further withdrawal of our sites can be done without preventing any of them being allocated later, in line with the finalised Neighbourhood Plan. As we write this we have still not heard back from them but we will continue to ask for this response. Should we not get their assurance then we will be keeping our remaining sites in the formal process. We know this is not what some may want to hear but we believe this is the best way forward as it allows us to maintain our options through the official process, including being able to continue to offer any development opportunities agreed with residents through the Neighbourhood Plan”. The one month extension can now, in hindsight, be seen purely a PR exercise, to defuse public anger and make it look like DHT was responding following the humiliating Community Conversation meeting. DHT argues here that it wanted to withdraw the sites, but that SHDC somehow wouldn’t let it, which is completely disingenuous. It is clear that leaving the sites in the ‘Our Plan’ process undermines the Neighbourhood Plan. Vaughan Lindsay admitted as much at the Community Conversation. It is also abundantly clear that should DHT withdraw the sites, they could be resubmitted at any moment. SHDC have no reason to issue such assurance in writing, as for their ‘Our Plan’ process it clearly makes life much easier to have so much land available for consideration in Dartington. What the above shows is the extent to which DHT, which so prides itself on experimentation and innovation, has become profoundly risk-averse, a tragic betrayal of its pioneering beginnings. The risk that SHDC would not allow the sites back in for consideration is virtually zero. The risk of alienating the local community, and the PR and reputational risk that DBDUC can do the Trust is far greater. This is not a decision that needed to involve SHDC. This is a discussion between the local community of Dartington village and DHT and its Trustees. The Trust could have, and still can, withdraw the sites. Anything else is cowardly, unprincipled and weak. “Although not ideal, we do not believe keeping the sites in the process pre-judges the Neighbourhood Plan process, which is something to which we are entirely committed. Our willingness to work with others marks us out from other speculative developers who may be less prepared to engage with local residents on development”. Not only is this decision “not ideal”, it is in complete disregard of the Trust’s values of social justice, sustainability and building resilient communities. It is also a slap in the face for the over 1,000 local people who signed the DCDUC petition. It is clear that leaving the sites in prejudges the Neighbourhood Plan, indeed it holes it beneath the waterline. To state otherwise is purely PR spin. We see no evidence of any genuine “willingness to work with others”. The Hunters Moon withdrawal was a humiliating climb-down in the face of overwhelming public hostility. DHT had no choice. What actually “marks us out from other speculative developers who may be less prepared to engage with local residents on development” is the fact that DHT benefits from charitable status and substantial tax breaks, from an endowment of land it now appears to view as a problem, the ability to run an organisation in a financially ruinous way that would not be tolerated in the private sector, and, most importantly, a supposed commitment to values of sustainability, social justice and community resilience. Speculative developers, sadly, do not have any pretence at having to live by these values. DHT does. While it is true that speculative developers would have less obligation to engage with their local community, for DHT to bleat about how good they are to even deign to engage with us is patronising, and fails to recognise actually how fortunate DHT is to have an engaged, intelligent community on its doorstep, who love the values on which the Trust was founded, and have spent the last 4 weeks trying to help them to actually live those values. “Although it is unfortunate that the ‘Our Plan’ and Neighbourhood Plan processes are out of step – something over which we have no control – it is useful to remind ourselves that we are still close to the start of the process with no decisions having yet been made, including how much development there will be in our Parish”. Leaving the sites in the ‘Our Plan’ process greatly increases the likelihood that Dartington will be viewed as a “growth hub” in the area, taking the pressure off other parishes to find land to accommodate development. We are, it is true, at the start of the process, yet this decision by DHT hugely shapes how it will unfold. To pretend otherwise is deceitful. There is no denying that our community will be expected to accommodate some new development but we have the safeguard of the community-led Neighbourhood Plan process, to which we are absolutely committed, to ensure that our community can influence how that allocation is delivered within the Parish. And the ‘Our Plan’ proposals will of course be subject to several layers of consultation at community, district and government level. As the WYG Consultants report, commissioned by DHT to put pressure on SHDC to accept its sites makes crystal clear, the presumption in planning, since the introduction of the National Planning Policy Framework, is in favour of planning permission. While there may be “several layers of consultation at community, district and government level”, once the sites are in the planning process, it is very hard to get them turned down. Given that potential sites are also filtered through a ‘Stakeholder Panel’, comprising local developers and landowners, on which Dartington is represented, we have very little faith in the democratic nature of the processes described. They need to be withdrawn. “In response to our community’s concerns we made a series of commitments on which we have taken immediate action. This demonstrates a change of approach and our commitment to working together. We have already withdrawn over half of the initial sites submitted; have had a productive meeting with the residents of Hunters Moon and have agreed to transfer this land into their community ownership; have submitted Aller Park as a potential brownfield site; and remain committed to funding part of the Neighbourhood Planning process”. These “commitments” are virtually worthless, and represent that Dartington Spin Machine at its best. It does anything but represent “a change of approach and our commitment to working together”. We have seen absolutely no evidence of this, rather a retrenchment into a “business-as-usual” approach. The sites withdrawn were unlikely ever to get planning permission anyway, being those classified as “amber” by SHDC. The Hunters Moon climbdown was based more on the extent of the opposition, the commitment by local people to pursue a legal case DHT looked set to lose, and substantial negative PR. Submitting Aller Park as a brownfield site is pretty much meaningless. In relation to DHT’s funding of the Neighbourhood Plan, DBDUC have written to Dartington Parish Council to ask that they refuse to accept this funding. It is not right that DHT, actively undermining the Neighbourhood Plan as it is, should be able to spin its financial support for the process as something demonstrating their deep good will for it. Withdraw all the sites. Now. Produce a document outlining how DHT will embody its values going forward in the decisions it makes regarding its off estate land. “We are the first to accept that we have made some mistakes but we hope these changes are seen in the spirit they are meant, as real attempts to listen and work better together”. Empty words. We feel we have been ignored, betrayed and treated with scorn by DHT’s Trustees who have refused to engage with us and held secret meetings behind closed doors. While the predominantly London-based Trustees may all move on to other Trusts in the next few years, and Mr Lindsay may well soon move on to some other well-paid post, it is us who have to live with the redevelopment of our parish. We see no evidence at all of any change of culture at the Trust. Rather, this decision speaks of retrenchment, risk aversion and weakness. “All of us at the Trust remain committed to working with the Parish to develop what we hope will be an exemplary community of which we can all be proud. There are some inspiring examples, like the Joseph Rowntree development at Derwenthorpe, of how land owners and communities have worked together to develop new and imaginative additions to their existing community. We also have our own new course in Ecological Design at Schumacher College that we can learn much from as well as input and ideas from the TTT Housing group and others. The potential to consider new approaches to self-build, co-housing and live-work spaces as well as creating an improved public realm and local energy systems is exciting and we have flagged with others, such as the Land Society, our enthusiasm for working in partnership to explore new models”. There are clearly other models than the horror show currently unfolding at Sawmill Field. But when the Trust states that it sees itself as a “speculative developer”, we hold out little hope. When the Trust is so disastrously run, losing millions every year, it is right that the local landscape and community suffer in order to fill the economic black hole? We have offered to help in shaping new models that actually meet our needs locally, but see no evidence that DHT even understands different approaches. If it did, why hire WYG? So far as we can tell, the “selling land to a conventional developer” route is still the Trustees’ preferred option. “As we have said before, we have a unique opportunity to use our land to do something truly inspiring and by working together with our community we believe we can achieve this”. The “unique opportunity” was the opportunity to withdraw these sites. It would have shown a genuine commitment to work with the local community, a genuine commitment to the Neighbourhood Plan process, a genuine desire to reconnect with the Trust’s values. It would have shown some leadership, it would have shown that the Trustees have some integrity and willingness to listen to local people. It would have shown the Trust standing up for the interests of local people, and actually committed to modelling a new approach for development and housing. Instead what we have seen is chronic organisational risk aversion. However DHT tries to spin this decision it is cowardly and spineless. Vaughan Lindsay even tried in an email to DBDUC to suggest that DHT’s failure to withdraw was somehow our fault! “However, my sense is the lobbying that they (SHDC) have received has made them more risk averse and they have said they will need to get formal legal consent”. DBDUK’s campaign will now step up a gear. We will conduct the UK’s first Community Vote of No Confidence. We will continue to explore the murkier corners of how DHT works. We will, in December, hold a very public funeral service for the sad passing of the values and principles of Dartington Hall Trust, to which the whole town will be invited. We do so with great sadness that such a great legacy has been, and continues to be, so squandered by DHT’s lamentable leadership.